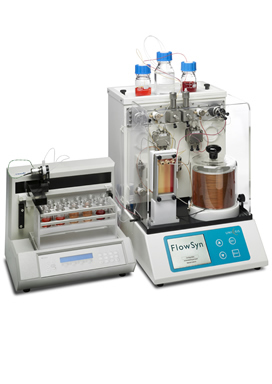 Take the drudgery out of reaction optimisation and translating batch chemistry to flow with our most popular system! The FlowSyn Multi-experiment package (FlowSyn Multi-X) uses an enhanced FlowSyn control interface to control either a single or a 4-rack fraction collector thereby enabling a sequence of experiments to be performed without the need for a separate PC. Capable of running unattended, it will perform up to 10 sequential experiment and collect the results as fractions or steady state samples allowing the user to vary the key flow-through parameters (stoichiometry, temperature and residence time) in each case. Add the Data Logging Software Package to both visualise data in real time and save pressure and temperature traces. Upgrade further by adding FlowControl system control software which links via Wi-Fi and automatically saves complete experimental procedures with all data, including automation events. FlowControl allows previous experiments to be reloaded and either viewed or repeated with or without modification. Moreover, additional pumps and reactor modules can be added and sequences of up to 100 individual experiments can be performed.